Ooohh! Lookie here, the first "knit in progress" post of the year! YAY!! I'm going to be straight up with you though and just say right now that I'm not going to show you any actual progress photos in this post as I know there are a few knitters out there who are either still up in the air about joining the KAL, can't decide on yarn/colours and therefore haven't started, or can't decide on which clue to follow and still haven't cast on yet (even though clue #2 has already been released as of yesterday). 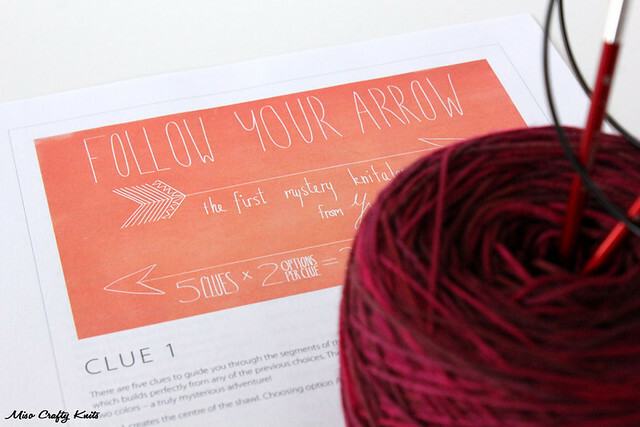 In case you missed it, I had mentioned in the last post that I had joined the Ysolda Teague Follow Your Arrow Mystery KAL. Since I'm using SweetGeorgia Yarns Tough Love Sock, this project will also qualify for the SGY Stash Dive KAL too. Double yays all around!! I had a little bit of a slow start at the cast on mark of the project because I had hemmed and hawed over my colour choices. 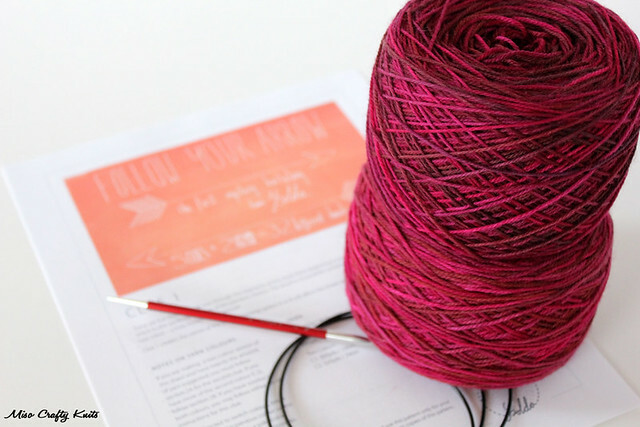 My original plan was to go the 2 colour route - my first choice after a little stash diving was a bright pink and deep grey (surprise, surprise) in luxury fibres of merino and silk, and MCN. But whilst I was going through the stash I found a beautiful, subtle variegated colourway with the perfect semi-solid to go with it. I couldn't make up my mind! So I had snapped photos of each and posted them on Instagram to see what other knitters thought. It was a no-brainer, the pink and grey colourway won out by a landslide. I thought I was all set. Then the first clue was released. I had read through both options and tried to picture in my head just how the colours and shawl design would play out. Uh-oh. All of a sudden I was not liking the idea of striping this shawl. Maybe I'm playing it too safe, maybe I'm a bore, but I just couldn't imagine myself wearing what I was picturing in my head. I know, I know...it's just one clue. I have no idea how the shawl will actually turn out. But I just couldn't wrap my head around such contrasting colours and the design I was envisioning from the pattern instructions. And yeah, I might as well admit it - I cheated by looking at a spoiler thread on Ravelry. I really couldn't handle not having even an inkling about where the design was taking us. Unlike other mystery KALs, like the Westknits Mystery Shawl where you can get a sense of what the design could possibly be judging from previous patterns from the designer (and at this time Stephen West was all about colour blocking), Ysolda is a bit of a mystery. She loves everything!! She has a thing for structure, texture, lace, cables, and she doesn't really do things twice. So not knowing where her mindset is in the direction of this design was killing me! I'm a horrible mystery knit-along knitter! Anyhoo, then I got the brilliant idea of: what if I just knit two shawls - one in 2 colours, one in a solid? That way I can rest in ease about my clue choices (and trust me, I'm not the only knitter to have thought this!!). But then reality slapped me in the face and I realized that with all that I have on my plate already there was no way I was going to be able to knit on an extra shawl. Not unless I forego sleep, parenting, general housekeeping, and possibly basic personal hygiene. So back to colour choices. Since I was using this project for the SGY Stash Dive KAL too, I knew I had to keep my yarn choices within the SGY stash. I finally bit the bullet and went with the subtle variegated colourway I had previously contemplated on, minus the skein of the complimentary semi-solid. Of everything I had in my SGY stash, this Pomegranate colourway was the only yarn that I had that wasn't designated to a certain project. I didn't want to break up any of my sweater quantities, my single skeins weren't going to be enough and what I did have 2 skeins of were too highly variegated for my liking. So by process of elimination, the 2 skeins of SGY Tough Love Sock in Pomegranate won out. A little story about these skeins that's more about how much of a yarn hoarder I really am: I bought one of these skeins 4 years ago at my LYS, after discovering that they were finally carrying SGY. All previous purchases were from a shop located in Vancouver. Back then I was still in the process of building my stash and was buying yarn solely because it was pretty and not because I had a specific project in mind. This skein was no different. I bought it because it was pretty, because yarn doesn't go bad, and because I adore all the colourways that SGY had. A year later I bought the second skein of this colourway at the same LYS when it was having one of its annual big sales. I had completely forgotten that I already had a skein of this colour in my now pretty darn large stash. I had no idea what I was going to do with this yarn, but it was so pretty and the little bits of fuchsia really convinced me to buy it and bring it home. So I did. Hey, maybe I'll make socks with it? I didn't notice my duplicate purchase until days later when I was updating my stash page on Ravelry. Oh well, I thought, maybe I'll knit socks with one skein and trade the other? No biggie, right? They were added to the stash and never really seen again. Except for the seasonal tossing of the stash. Fast forward to last week when I pulled out the second skein and discovered that the 2 skeins were of different dye lots and were quite noticeably different (check out the photo above - the yarn on the bottom was the first skein I had bought and the yarn on top was the one that woo'd me at the sale). There was no way I was going to be able to pull off knitting straight until 1 skein ends so that I can start the other seamlessly, I was going to have to alternate skeins. Darn. I hate weaving in unnecessary ends. Oh well. That's the price you pay for being an unprepared yarn hoarder. So that's the story of the yarn. As for the knitting, there's not much to say. Quite surprisingly I finished the first clue within a few hours even though the chart had me confused for a while there. Lucky for me the pattern includes both the chart and written instructions. I haven't started clue #2 yet, as I'm still trying to decide which clue to go with. Unlike a lot of the KAL knitters out there, I don't have a game plan set for when it comes to choosing which clues to go with. I know some knitters are planning on sticking with the same option each clue, some are alternating them, and some are alternating between which has a chart and which doesn't. I wish I was as organized as these knitters are! So far the only plan of attack I've come up with is that I should have my clue knit up by Thursday so that I can spend the rest of the week concentrating on other projects. If you want to follow along as I knit this mystery shawl up, you can check out my Instagram feed. In the meantime, who else has joined this KAL? Have you cast on yet? Have you finished clue 2? Did you go with 2 colours or 1? What's your plan of action when it comes to choosing which clue to follow? Let's chat!! I haven't joined this KAL but I do look forward to seeing your progress. I like the idea of a single-color version - great problem solving! Thanks Stefanie! :) It has definitely been an interesting KAL! Which clues are you doing? I'm doing a solid colour, did 1B, and then modified it after the second set of clues came out, and have recharted 2A to make it symmetrical with 1B. So I'm definitely following my own arrow! I must say that 1A freaked me out when I saw it, but the two colour versions look great now that the second set of clues has been added on to them. It will be interesting to see where this goes! 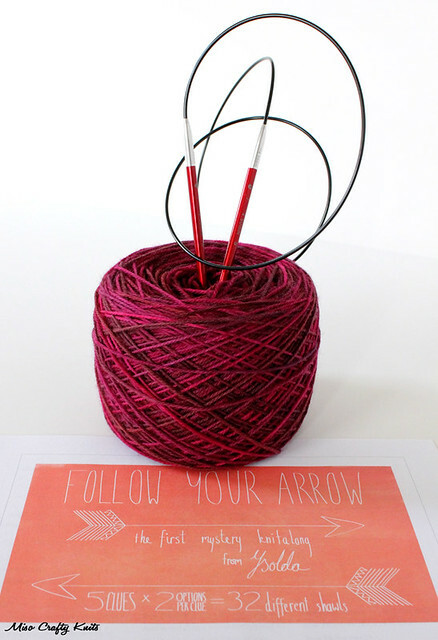 So far I've followed my arrows to have my shawl be 1B, 2A, 1B.